According to the American Cancer Society, more than 700,000 new cases of liver cancer are diagnosed worldwide each year. Currently, the only cure for the disease is to surgically remove the cancerous part of the liver or transplant the entire organ. However, an international study led by University of Missouri School of Medicine researchers has proven that a new minimally invasive approach targets and destroys precancerous tumor cells in the livers of mice and in vitro human cells. 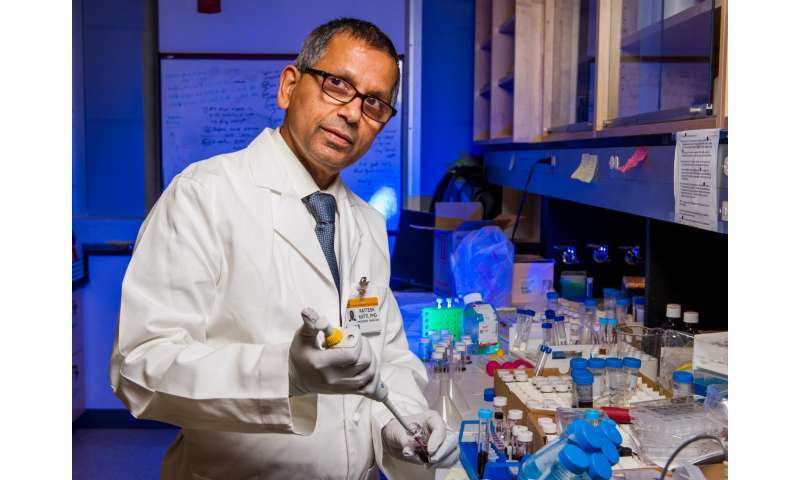 "The limitations when treating most forms of cancer involve collateral damage to healthy cells near tumor sites," said Kattesh Katti, Ph.D., Curators' Professor of Radiology and Physics at the MU School of Medicine and lead author of the study. "For more than a decade we have studied the use of nanotechnology to test whether targeted treatments would reduce or eliminate damage to nearby healthy cells. Of particular interest has been the use of green nanotechnology approaches pioneered here at MU that use natural chemical compounds from plants." The study was conducted in the United States and Egypt, and it involved the use of gold nanoparticles encapsulated by a protective stabilizer called gum Arabic. The nanoparticles were introduced to the livers of mice intravenously and were heated with a laser through a process known as photothermal therapy. "Gum Arabic is a natural gum made of the hardened sap from acacia trees," said Katti, who also serves as director of the MU Institute of Green Nanotechnology and is the Margaret Proctor Mulligan Distinguished Professor of Medical Research at the MU School of Medicine. "It is FDA-approved for human consumption and is primarily used in the food industry as an additive. It also promotes adhesion of gold nanoparticles engineered to attract to precancerous and malignant cells - which are much more susceptible to lower levels of heat than healthy cells. Once the nanoparticles travel and adhere to cancerous cells, they are heated to a temperature that destroys them but leaves healthy tissue unaffected." Katti's team studied a total of 224 mice. Half were identified as having precancerous cells in their livers. The other half had normal liver tissue. Outside of the control group, the mice received either an intravenous injection of gum Arabic alone or gum Arabic-encapsulated gold nanoparticles with or without laser therapy. "The administration of gum Arabic, gold nanoparticles and photothermal therapy caused no change to healthy tissue, which confirmed the safe use of these treatments," Katti said. "However, the use of gum Arabic-encapsulated nanoparticles combined with photothermal therapy resulted in the targeted eradication of the precancerous cells and their genetic code in both our mice model and the human in vitro cell model we developed for this study." Katti said the next step for further developing the technique into a cancer treatment for humans will be a clinical trial. "The components for this new therapy are inexpensive, do not have any issues associated with a shelf-life and are easy to produce," Katti said. "Most importantly, it does not involve the use of harsh chemotherapy drugs or radiation. It is a 'green' approach that also may lead to successful treatment of other forms of cancer."